AirAsia has been named the World’s Best Low-Cost Airline for the tenth year in a row. 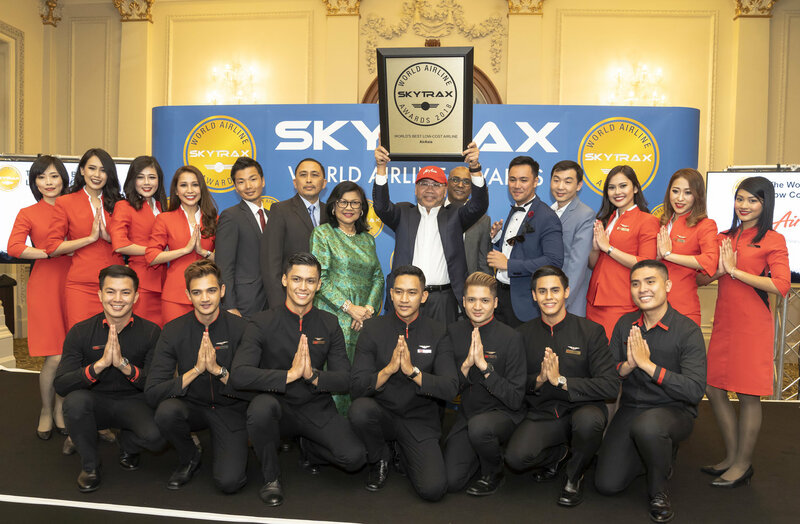 AirAsia won the accolade at the 2018 Skytrax World Airline Awards, held today at The Langham, London. Dubbed the ‘Oscars of the Aviation Industry’, the Skytrax Awards are the global benchmark of airline excellence with over 20.36 million customers surveyed worldwide by more than 105 nationalities, measuring standards across 49 key performance indicators of an airline’s frontline products and services. AirAsia co-founder, Executive Chairman of AirAsia Group Berhad and Group CEO of AirAsia X Datuk Kamarudin Meranun accepted the award in London together with AirAsia’s long-serving Allstars from across the region. The four selected Allstars were Acting Head of Ground Operations Ahmad Bin Ismail from Malaysia (17 years of service), Assistant Cabin Crew Manager Robert Anthony Gutierrez from the Philippines (7 years of service), Head of ICT Pipat Khunprakan from Thailand, AirAsia first staff in Thailand (15 years of service) and Assistant Flight Dispatch Manager Koji Kaneko who dispatched AirAsia Japan’s very first flight (4 years of service). AirAsia X was also presented World’s Best Low-Cost Airline Premium Cabin for the sixth consecutive year. Chairwoman of AirAsia X Tan Sri Rafidah Aziz accepted the award for AirAsia X.
AirAsia also took home Asia’s Best Low-Cost Airline, received by Deputy Group CEO (Airline Business) Bo Lingam who joined AirAsia in 2001 as a Ground Operations Manager. In true One AirAsia spirit, the win was celebrated across the group in AirAsia offices in Kuala Lumpur, Bangkok, Jakarta, Manila, Bangalore and Nagoya, with a special live interactive show broadcasted on AirAsia’s Facebook page.